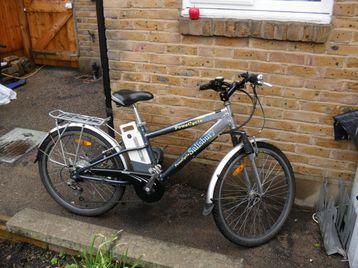 For short distance travel between 5 to 30 miles a day in urban areas, an electric bicycle is the best environmental friendly mode of transport. That too without increasing the time and the cost of travel. The electric motor of the e-bicycle is driven by a grid charged battery. And the mechanical energy provided by the motor is ten times more efficient than that a normal human gets by eating a standard diet. 1. Climbing up a hill It is obvious and one of the basic advantages. While climbing up an inclined surface the ‘groan’ factor plays an important role. This factor is eliminated with an electric bicycle. An efficient electric bike flattens the hill as a result the average speed of the rider increases. With a reasonable effort the rider can easily climb hills of 1 in 10, i.e. 10% and can climb a gradient of 1 in 7 i.e. 14% or more. In a hill station this is just amazing. 2. Electric bikes are safer. This may sound unbelievable, but this is true. Think of a situation when the cars are moving up a steep road at 30 mph and you are riding a manual bicycle in the same road at 6 mph. Imagine the number of cars that will be passing by you at a relative speed of 24 mph. But if you are riding an electric bike, you can run along the same road at a speed of 12 mph. Now the number of cars that will pass by you is at least 33% lower and that too at a relative speed of 18 mph only. Does not that make you safer? It is simple. Faster your speed of travel, sooner you reach your destination and safer you are. Same is true when you are crossing road junctions. The other advantage is that when you are riding up the hills comfortably, you will also not rush while climbing down and reduce your risk. Cycling is a great exercise and helps one to keep fit. But you will only get the benefit if you ride your bike regularly. Research shows that 46% of conventional bike owners use the bikes only once or twice a week. Another 30% use their bikes only once in 15 days or even less. In contrary, a recent survey has shown that 81% user of electric bikes use their bikes at least once a week and one third of the users ride their bikes at least once a day. The above observations confirm that electric bikes are used at least twice more frequently than conventional bikes. Riding an electric bike is an enjoyable, especially in hilly regions. When strong wind is blowing or you have to carry a heavy load on your bike – the electric bike requires only half the effort from the rider. As a result the rider tends to use the bike more frequently; at least twice than he would have done with a conventional bike, thus the rider gets more physical exercise. 4. Keeps you free of sweat. You may not mind sweating when you are on a leisure ride, but while cycling to work sweat definitely is a nuisance. While some employers may provide shower facilities for cyclers, that too unwillingly, most of them do not. An electric bike is the solution. It reduces the load of the rider to a great extent. When the weather is cold, or when you need a bit more of exercise, you can just turn off the motor. 5. Clean and environment friendly. The electric bike does consume energy while the conventional bikes do not. But the amount is very less as compared to a moped, motorcycle or a car. It also consumes battery, but the battery can be recycled. The average electric energy consumption of an electric bike is 100 to 150 watts. In comparison a car, which understandably runs much faster, consumes about 15,000 watts. Compared to any other commercially available vehicle, an electric bike is most fuel efficient with a consumption of about 800 – 2,000mpg (290 – 700 liters / kilometer) of energy. Think of the energy consumed by a 100 watt electric bulb glowing in your house for one evening – this is all Thant is required for running your electric bike for 20 to 40 miles!